I don’t know about you, but I grew up with the shiniest radio flyer wagon EVER and I adored it. My wagon was for stuffed animal parades. For fun rides around the block. And, for endless hours of walking and talking to myself…. I think Radio Flyer does that, don’t you think? Radio Flyer not only delivers as the world’s leading builder of wagons, tricycles, pre-school scooters, and other ride-ons, but they’re also a timeless symbol of childhood imagination. For 100 years, Radio Flyer has been powering play and inspiring imagination for kids of all ages. I guess that’s why I still want to jump into and play with my kid’s Radio Flyer, huh?? 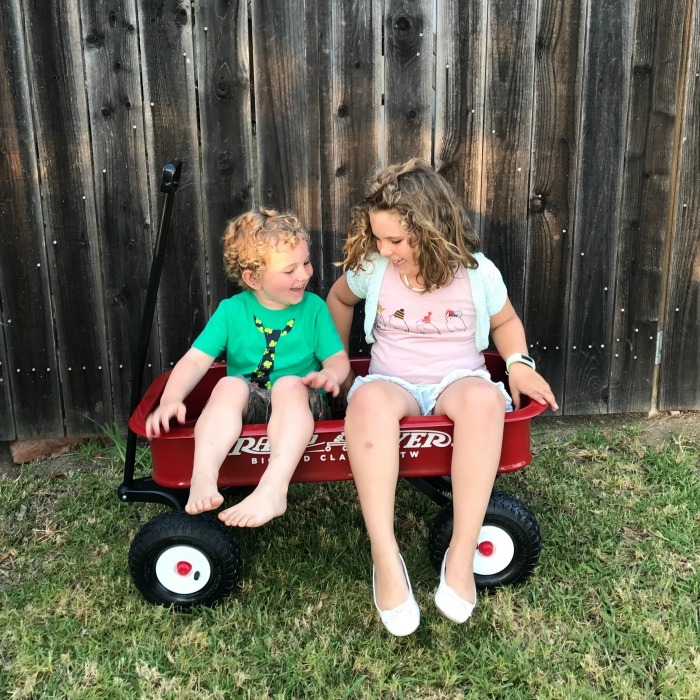 They’ve paired up with I See Me books to create a My Radio Flyer Adventure version that features YOUR child’s name, hair color, skin tone, and takes them on a super fun, custom adventure. We have a 15% off code to purchase your own book just for being a Happily Ever Mom reader! 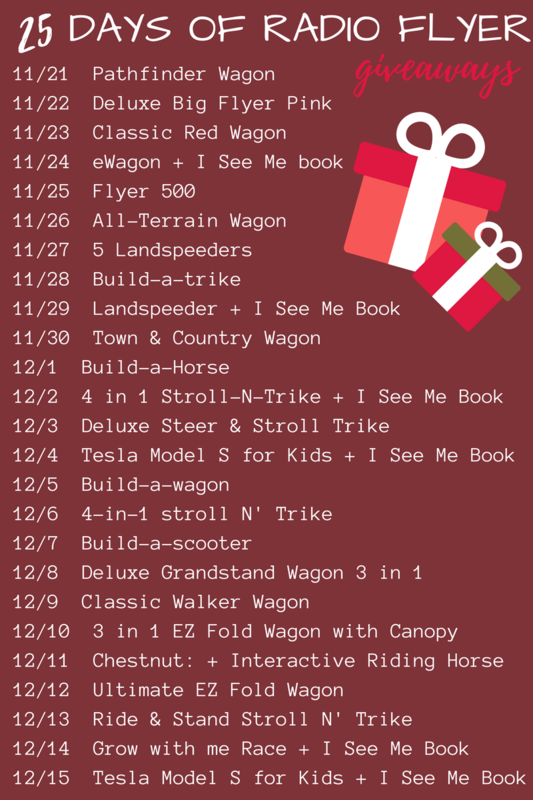 They have 25 days of EPIC holiday giveaways beginning Tuesday, November 21st, 2017 – Friday, December 15th, 2017 so you have the chance to win amazing prizes daily! Let’s find out more, shall we?? My four-year-old asked to have his name in a book a few weeks ago. If you haven’t heard about I See Me books, they’re custom adventure books that have your child’s full name inside. My oldest child got one when she was a baby. But, my four-year-old? He didn’t have one yet. He was getting a custom My Radio Flyer Adventure book with his name inside!! Imagine the look on his face when I told him that he was going to have a book with his name in it that was ALL about an adventure with his radio flyer wagon?! We clicked over to the Radio Flyer website together and my son went through all of the questions quickly. It was all super easy to fill out. Within a matter of minutes, we ordered his very own, custom adventure book. The best part about the I See Books is that it helps little ones with name recognition in a really unique way. Unless you’re writing books with your kids or they just *happen* to share a name with the main character, they aren’t going to hear many stories that feature THEIR own name. The unexpected part about his Radio Flyer book is that it’s gotten him excited about getting outside to play with his wagon too. Just like I did as a kid. KATIEJ15 for 15% off through December 31, 2017. Just click on this link to order the book. Click on that and enter KATIEJ15 to see 15% taken off immediately! Continue to purchase the book. 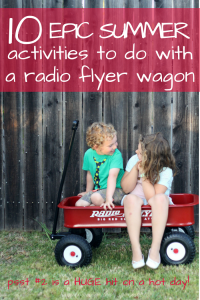 Every day Radio Flyer will be giving away one item to one lucky participant. Just click HERE and enter your information. Then, come back to the link every day to re-enter for a new prize. This GIVEAWAY is live until December 15, 2017. Good luck and happy wagon riding!